If you’ve received your FREE $20 Rue La La credit, you can get a completely FREE Lip color, eye shadow or blush set! Just head over to Rue La La and login. After doing so, click on the ‘Boutiques’ tab and then in the drop down menu, choose the first option, ‘Sunday Night Styleathon’. 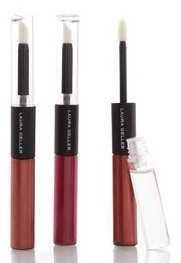 Click on ‘Laura Geller’ and you’ll see a couple eye, lip and blush sets priced at $9.99, down from $35 to $45! Choose a set and start the checkout process. The FREE $20 credit in your account will cover the cost of the item and the cost of shipping! You won’t have to pay anything out of your pocket! If you haven’t yet signed up to get your FREE $20 Rue La La credit, you still have time! Just go here to check out all the details and sign up.